THE popular Hayling Kitesurfing Armada returned over the weekend with a bang as people kicked back and soaked up the sunshine while watching world class performers from around the world in action. The free event saw hundreds camp out in the sweltering conditions before cooling off by taking a dip in the sea and enjoying the eclectic mix of water sports on offer for people of all abilities. There was also live music, demonstrations and tutorials, tasty food stalls and bars as well as an array of kitesurfing stalls offering equipment for those looking to take the plunge. 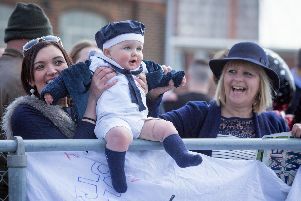 Around 7,000 people attended the three-day event from Friday through to Sunday with this year’s event the biggest and best one yet. Now in its sixth year, the event has raised £180,000 for good causes since it started. This year money was being raised for the Armada Trust and the Hayling First Responders. The environmentally friendly event saw organisers’ good for their word after ditching single-use plastics to join the Final Straw campaign with Final Straw Solent. Organiser Dan Charlish said: ‘We’ve had a terrific amount of support from people coming over the three days – the largest kitesurfing event in Europe. ‘It’s a great place to come and unwind and take part in kite surfing whether you ar a beginner or more experienced. We have hosted the British Kitesurfing championships but want to get as many people as possible involved by offering sessions for those who have just began. ‘There’s the chance to learn from the world-class talent that we have here who have been doing lots of demos and showing people what they can do as well as teaching them the basics. ‘We’ve been blessed by amazing weather which has really helped see so many people turn out. There is something for everyone with all the music and stalls. ‘We’ve also ensured there’s been no plastic which as an environmentally friendly sport we feel is the right thing to do. After all we have no engines or fuel, it is all natural. ‘It’s been great to see so many people from around the world come here – from places like South Africa to Hawaii. ‘But the local community is also very important to us and we like to make sure we give back to them by putting on a great show and supporting charities here to say thank you for their amazing support.